A review in 10 words (or thereabouts): Small town Lou is about to meet someone who can give her the world. Lou Clark just can't seem to get her life together. She lives at home with her family, struggling to get bills paid. She has been dating the same boy for years with no signs of a commitment in the near future. And she has just lost her job at a local cafe, a job she loved but knew was never going to take her out of the small town she has lived in her whole life. And then she meets Will Traynor. A motorcycle accident has left him all but paralyzed and the adventurous world he once knew is over. They both need something, someone. And for Lou, Will is just the bit of hope she's been looking for. An unconventional love story. Lou Clark isn't your typical romantic lead. She dresses a little crazy, talks a little too much, and is struggling to get her life together. She was so refreshingly real, and her journey so refreshingly genuine, that I went on a rather emotional ride. It didn't end the way I wanted it to end. I'd explain a little further, but I don't want to give anything away. While I adored Lou, I had some serious issues with her family. Goodnatured ribbing is one thing, terribly sarcastic criticisms are another. And her sister...oh don't get me started on her sister. Nothing like a terribly selfish character to make you crazy. Need a good cry? Give this book a read. I've come to the conclusion that I'm an extremely sensitive reader. Books get to me. And this book turned on the water works. I just enjoyed Lou so much and enjoyed watching her relationship with Will develop that the end really hit hard. 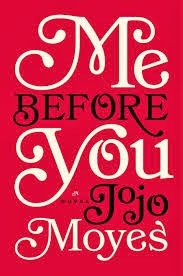 Jojo Moyes is most definitely an author that I will have to visit again.